Western groundsel is a fairly tall plant (eight to twenty-eight inches) with a single upright stem and large, smooth-edged leaves. 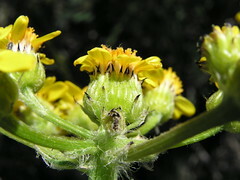 Although daisy-like, groundsels appear flat-topped with several to numerous small, yellow heads borne near the tips of equal-height branches. Young plants are covered with white loose hairs that are lost in older plants. Most of the leaves grow from the base and are up to ten inches long and two inches wide. The upper leaves become progressively smaller. Each head produces about twenty smooth seeds with long white bristles to carry them away in the wind. The groundsel species contain poisonous alkaloids but are sufficiently unpalatable that livestock seldom eat them.